Neck-soreness is a common complaint following vertebral stabilization basket surgery; although ataxia is often greatly improved, neck soreness can linger for months following surgery. Acupuncture has often been used to treat human neck pain but no published studies have examined its use in equine neck pain. In this particular case, five sessions of dry needling have subjectively improved the patient’s neck pain. The patient is a 17 hand 2017 Thoroughbred colt who resides on a small, well-managed farm in Georgetown, Kentucky. The colt was first noted to be ataxic (Grade 3/5) in mid-June 2018. He was up to date on all vaccinations and afebrile. Neck range of motion was within normal limits at this time. Equine protozoal myeloencephalitis (EPM) serum SAG 2/3/4 ELISA testing was negative on June 18, 2018 and a myelogram performed on June 22, 2018 showed compression of the spinal cord between the sixth and seventh cervical (C6, C7) vertebrae. EPM SAG 2/3/4 testing on the cerebrospinal fluid (CSF) was also negative at this time. On June 24, 2018, the horse was anesthetized and underwent vertebral stabilization basket surgery, with the implant placed across the sixth and seventh vertebral space. As is routine, follow up radiographs were performed in late July, late August and late September to confirm placement of the implant. Following surgery, the colt’s ataxia improved but he developed a reluctance to bend to the right. The patient was initially examined for acupuncture treatment on November 28, 2018. Initial examination included a neurologic and musculoskeletal evaluation. The myofascial evaluation was abbreviated due to patient temperament. On neurologic examination, the colt was graded 1/5. On tight circles the colt occasionally had difficulty crossing over behind, was slightly hypermetric with his hind limbs and would stumble occasionally on uneven ground. Musculoskeletal evaluation revealed no lameness. On myofascial evaluation, a tight band was palpated on the left side within the trapezius muscle. Paniculus palpation revealed no other abnormalities. When evaluating the range of motion of the colt’s neck, there was a marked difference between the right and left sides; the right side had about fifty percent of the range of motion of the left. When turning to the right, the colt had a tendency to rear up, presumably in order to turn in a tight circle without having to bend his neck. Based on physical examination, the patient’s problems consisted of unwillingness to bend his neck to the right and mild hindlimb ataxia (Grade 1/5). Unlikely differentials for this problem include infectious causes (vertebral body abscess, EPM, meningitis, eastern and western equine encephalitis [EEE, WEE], West Nile virus [WNV], rabies, or equine herpesvirus-1 myeloencephalopathy [EHM]), leiomyosarcoma in the neck muscle, or degenerative joint disease of the cervical vertebrae. More likely causes include trauma, a thrombosed jugular vein, decreased range of motion secondary to fusion of the vertebrae as a result of the implant, or trigger points or muscle strain to the neck musculature. There are many causes of hindlimb ataxia in horses. Rare possible causes include an infarct of the spinal cord, a space occupying lesion within the spinal canal, metastatic leiomyosarcoma (Kawabata 2016), or an autoimmune cause. More common causes of ataxia in horses include infectious causes (EPM, EEE, WEE, rabies, WNV), degenerative joint disease of the articular processes causing lateral compression of the spinal cord, equine degenerative myelopathy, Johnsongrass toxicity, cervical vertebral stenotic myelopathy, occipto-atalanto-axial malformation, trauma to the cervical vertebrae, or hyperammonemia or hyponatremia. Contagious causes (EEE, WEE, WNV, rabies, EHM) were ruled out based on the patient’s vaccination history and lack of fever. Because the patient was afebrile, a vertebral body abscess was unlikely, and radiographs showed no evidence of osteomyelitis or trauma. A definitive diagnosis for EPM is not possible without a post-mortem examination, but negative CSF and serum titers made it unlikely. Leiomyosarcomas are rare; therefore, an ultrasonographic evaluation of the neck musculature was not pursued. Physical examination ruled out a thrombosed jugular vein. Radiographs did show progressive fusion of the C6 and C7 vertebrae following implant placement, and myofascial palpation did reveal a tight band in the left trapezius. Therefore, the most likely explanation for the lack of range of motion in the patient is a combination of mechanical (secondary to implant placement and joint fusion) and muscular tightness and trigger points. Again, contagious causes (EEE, WEE, WNV, rabies and EHM) were ruled out based on the patient’s vaccination history and lack of fever. Spinal cord infarcts and autoimmune-mediated ataxia have never been reported in horses in the literature, to my knowledge. There has been one report of a metastatic leiomyosarcoma causing ataxia in a senior equid. EPM and equine degenerative myelopathy require post-mortem examination to definitively diagnose; however, EPM titers were negative and the horse was supplemented with Vitamin E throughout treatment, making these conditions less likely. Johnsongrass toxicity has been reported in horses in Kentucky but no Johnsongrass was apparent on this farm. The horse had no history or evidence of gastrointestinal, hepatic or renal disease, making hyperammonemia or hyponatremia unlikely. Standing cervical radiographs ruled out occipto-atalanto-axial malformation and trauma to the cervical vertebrae and were suggestive of cervical vertebral stenotic myelopathy at C6-C7. A myelogram confirmed this diagnosis, as did improvement in the patient’s ataxia following basket implantation. Basket surgery typically improves spinal ataxia by 1 grade; this patient improved by 2 grades but still remains mildly ataxic. The ataxia in this patient was greatly improved by cervical vertebral stabilization basket surgery, enough so that the horse is now safe to handle and enter training. However, the neck pain remained a problem, especially since the horse often reared when asked to turn to the right. Therefore, I focused my treatment on the neck pain, not the ataxia. Points were selected based on their neuromodulatory effects on cervical pain. Patient size and temperament were also taken into account; because of this, I chose to focus treatment on the patient’s neck and shoulder, and avoid his back (which would be difficult to reach without a stepstool) and limbs. The length of time the needles were left in place was also dictated by patient temperament. Electroacupuncture likely would have been beneficial in this case, but due to patient temperament was not attempted. Throughout each session, the patient moved frequently and without sedation, would not have stood still enough to undergo electroacupuncture. A laser would likely have been beneficial but was not available. Because the needles were left in place for a relatively short amount of time, and electrical stimulation was not utilized, I performed five treatments – until an appreciable difference in patient willingness to bend to the right was noted. The patient underwent five dry needling sessions, spaced seven to fourteen days apart. The needles used for all five sessions were Seirin 0.25 x 30mm. On the first day, the points used included SI 12, SI 11, BL 10, LI 16, GB 21 and LI 17. All the points were utilized bilaterally. One additional needle was placed in the tight band in the left trapezius muscle. LI 16 was selected as the initial point due to its anti-anxiety effects – the patient immediately seemed calmer after inserting this needle. The remainder of the points were selected due to their effects on the neck and shoulder. The needles were left in place for ten to fifteen minutes, then removed due to patient temperament. The remaining treatments utilized a combination of BL 10, LI 16, GB 21, LI 17, TH 16, SI 16, and LI 18 bilaterally. Following the first treatment, the tight band in the trapezius muscle was not palpable and therefore was not treated. Again, LI 16 was inserted first to help with anxiety and neck pain. The remainder of the points were selected due to their effects on cervical neck pain. As one of the treatment photos shows, LI 15, TH 14, SI 11 and SI 12 were utilized on the December 14 treatment due to their ease of access (the patient was especially fractious on this date) and to see if they would have a positive effect. Again, the needles remained in place for ten to fifteen minutes, then were removed. The surgeons at our practice perform vertebral stabilization basket surgeries regularly, and many of the horses remain locally for rehabilitation following surgery. As such, our ambulatory department is frequently called to perform follow up radiographs and evaluations on these horses. A significant portion of these horses remain neck sore following surgery, some for as long as several months. I was interested to see if acupuncture could help with neck soreness in these horses. Acupuncture has been shown in the literature to help with chronic neck pain in humans. In a 2004 study from the United Kingdom, when compared to placebo, acupuncture reduced chronic neck pain statistically, and both the placebo and acupuncture reduced chronic neck pain clinically – possibly due to weak placebo stimulation of acupuncture points (White 2004). Another study out of Germany showed that distant-point acupuncture was superior to both dry needling of myofascial trigger points and sham acupuncture in reducing clinical neck pain and improving range of motion (Irnich 2002). 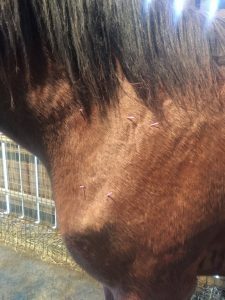 Because of these studies, and the clinical experiences of a large rehab farm that regularly utilizes acupuncture in treating these cases, I felt that acupuncture could help this horse. Overall, acupuncture treatment does appear to have helped this patient. Before treatment, the horse would rear every time he was asked to turn to the right; following five treatment sessions, the horse would still occasionally hesitate before turning to the right but was more willing to do so and rarely reared. Additionally, the range of motion of neck movement to the right improved significantly, from about 50 percent to 80 percent of the range of motion when compared to the left side. 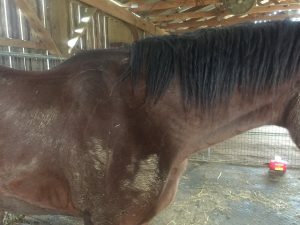 While the colt was undergoing treatment, husbandry was identical to his unaffected companion; he received no additional medication or treatments, other than the acupuncture. 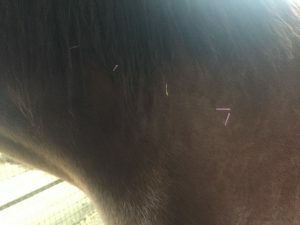 Although the patient was a young Thoroughbred colt, he tolerated acupuncture treatment well, and I would not hesitate to recommend it for other post-basket surgery cases. However, I think it is important to wait several months post-surgery to ensure boney fusion is well underway before initiating acupuncture treatment; in many cases, neck soreness and decreased range of motion may be protective and help keep the basket from migrating. There are other treatment modalities that may have been beneficial to this patient, especially massage and laser therapy. Prior to surgery, the horse was moderately to severely ataxic but not painful; he had a normal range of motion in his neck but was so ataxic that he fell during the twenty-minute van ride to the clinic for his neurologic examination and myelogram. Basket surgery is painful for these patients – not only is there a large amount of soft tissue to get through to expose the vertebrae (a ventral approach is used), a portion of the bone is removed, an implant is placed and bony fusion must occur. While a painful surgery is not ideal for patient welfare, ataxic horses are dangerous to human handlers and themselves, and the other option is often euthanasia. In the immediate post-operative period, this pain is likely somewhat protective (the patient minimizes movement which allows bony fusion to occur). Because of this, acupuncture should probably be avoided in the immediate post-operative period; with this patient, we waited several months before beginning acupuncture treatment. The treatments did seem to significantly improve the range of motion in this patient’s neck. Going forward, the owner will monitor the horse and seek further treatment if he regresses. If he does, he may need to remain on a regular treatment schedule. This horse is intended to be used as a racehorse. Following basket surgery and acupuncture treatment, his ataxia and range of motion have improved to the point that he appears to be safe to ride. However, he still makes occasional mistakes behind. For this reason, it is important to disclose the surgery to future riders and to ensure that he is only ridden by consenting adults. His neurologic status should be monitored closely by veterinarians going forward. Irnich, D, Behrens, N, Gleditsch, JM, Stör, W, Schreiber, MA, Schöps, P, Vickers, AJ and Beyer, A. 2002. Effects of dry needling and acupuncture at distant points in chronic neck pain: results of a randomized, double-blind sham-controlled crossover trial. Pain 99. 83-89. Kawabata, A, Del Piero, F, Caserto, BG and Langohr, I. 2016. Metastatic leiomyosarcoma causing ataxia in a horse. Journal of Equine Veterinary Science 43. 23-27. White, P, Lewith, G, Prescott, P and Conway, J. 2004. Acupuncture versus placebo for the treatment of chronic mechanical neck pain. Annals of Internal Medicine 141. 911-919.